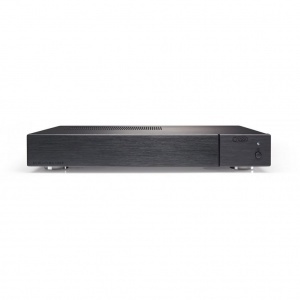 If you wish to stream music from the Internet, listen to high-resolution music from a computer, satellite receiver or TV, or play CDs at the highest quality, the EVOLUTION 100CD is the product for you. 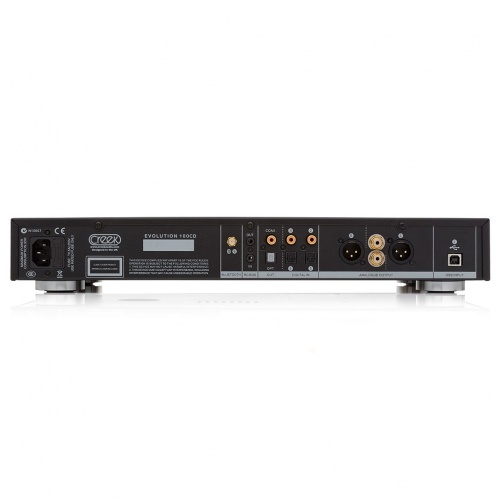 Its, highly flexible, digital pre-amplifier easily switches between any of these sources and can remotely control the output volume, in the digital domain. 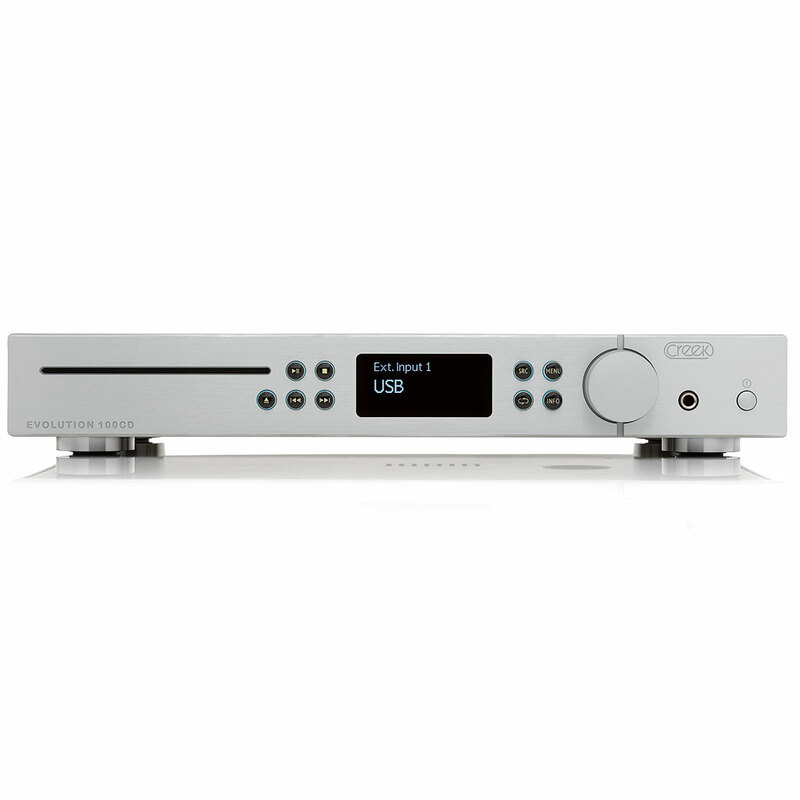 With multiple digital inputs and outputs, the EVOLUTION 100CD is one of the most well equipped and seriously high-end DAC products on the market, despite its competitive price. The Evolution 100CD player will work very well in the following system. Please note the speakers should be selected to match the size of your listening room. 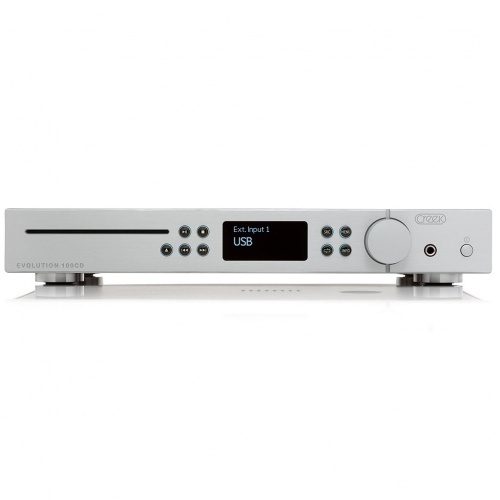 The EVOLUTION 100CD is a high-end DAC, with built-in CD transport and not just a CD Player. It can accept a total of seven digital sources, including Bluetooth. It also has two digital outputs and a custom Creek RC bus to extend the Infra Red Sensor or synchronise it with its matching amplifier. To fully realise the potential sonic benefits of streaming hi-resolution music files from a computer, asynchronous USB support is vital. The Evolution 100’s Class 2 asynchronous USB circuit works on different computer platforms but requires a custom driver to be downloaded from the Creek website to enable it to work with PCs. The highest quality audio output is available via balanced or un-balanced sockets for maximum flexibility. Balanced outputs are recommended if long interconnects are needed. After extensive listening tests, Creek Audio’s staff selected the best sounding output circuitry before finalising the design. Un-balanced outputs are via heavy duty gold plated, solid RCA sockets. If discreet headphone listening is required, there is a built-in high performance headphone amplifier capable of driving most types of headphones, (8 to 2k Ohms recommended range). Volume is adjustable from the front panel or by remote control. To maintain top performance, the custom CDM-1 slot-drive CD transport is clocked by a separate, extremely accurate ultra-low jitter, master-clock, situated right next to the DAC for bit-perfect performance. The EVOLUTION 100CD uses a powerful 30 Watt toroidal mains transformer to maintain a low magnetic field and excellent noise performance. It features three separate windings, to power its analogue and digital circuitry and custom CD transport. Multiple low-impedance power supply capacitors and voltage regulators are used to optimise the power supplies’ performance. Organic polymer capacitors are used to decouple critical analogue and digital circuits and high-grade WIMA polypropylene capacitors are used in the output filters. 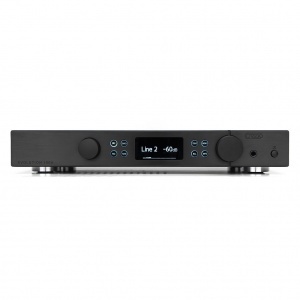 To optimise its performance, the EVOLUTION 100CD uses two top-of-the-range 24 Bit 192 kHz stereo DACs, running in double differential mode, to improve the cancellation of distortion and noise. A multiple frequency, low-jitter, clock optimises the performance of the DAC at all sample rates. A completely independent clock maintains bit-perfect performance for Compact Disc. Cosmetically the EVOLUTION 100CD is similar to the EVOLUTION 50A and EVOLUTION 100A integrated amplifiers; its slim case and luxurious front panel is finished in either black or silver brushed aluminium and deeply engraved. Also, like the matching amp, the EVOLUTION 100CD’s soft touch push buttons have excellent tactile feel. Each button is backlit to clearly display usable functions, for optimum user-friendliness. All Creek Evolution products now feature large OLED (Organic Light Emitting Diode) displays, providing higher clarity and resolution than other technologies. Display and button brightness levels can be adjusted or turned-off, via the remote handset. The EVO system remote handset controls all the functions of the EVOLUTION range, including the Amp, CD/DAC, Ambit Tuner and Ruby DAC. Power supply: 30 Watt toroidal mains transformer with 3 separate secondary voltage windings, with multi-cap power supply decoupling and multiple ultra-low noise discrete power supply voltage regulators. Input receiver: WM8805, multichannel digital input receiver and clock generator.